What are the advantages of publishing with New Voices in Japanese Studies? Read about our editorial vision and see feedback from recent authors to find out. For details, see the Call for Papers page. How frequently is New Voices in Japanese Studies published? The journal currently publishes one issue annually, released mid-year to coincide with key area studies conferences in Australia. However, frequency has fluctuated in the past due to a variety of circumstances including the number and quality of submissions received. When do your Calls for Papers usually open? 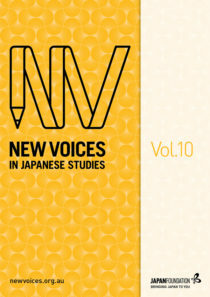 New Voices in Japanese Studies has at least one, sometimes two, Calls for Papers annually. The regular Call for Papers generally opens in August, around a month after the release of a new volume, and closes in mid-October (for Masters/PhD submissions) or early November (for Honours submissions). Note that reviews can be proposed at any time, regardless of whether or not a Call for Papers is open. Find out more about reviewing for us on our Review Guidelines page. How can I find out about Calls for Papers or new volumes? Subscribe to our newsletter to receive news related to New Voices in Japanese Studies. You can also follow us on Twitter at @NVJSjournal. Does New Voices in Japanese Studies have a Style Guide? Yes. The NVJS Style Guide is available online as a standalone PDF and is also included in the Submission Pack download. Note that the Style Guide is updated before each call for papers, so if you intend to submit, make sure that you are using the most up-to-date version. What is the word limit for submissions? Between 5000 and 8000 words (including footnotes but not References list). What kinds of submissions are accepted? New Voices in Japanese Studies only accepts original, sole-authored academic papers that have not been published or submitted elsewhere. They can be from any discipline (in principle), but must be related to Japan and must be written by an Honours, Masters or PhD student/recent graduate with ties to Australia or New Zealand. See more on our Call for Papers page. Are there any costs to authors for publishing? No. New Voices in Japanese Studies is a non-profit initiative fully funded by The Japan Foundation, Sydney to support emerging researchers in its local region. No fees are charged to authors at any part of the process, and content is also completely free and open access for readers. When a call for papers is open, the instructions for submission will be available on the Submission Guidelines page. Make sure you check the Eligibility Criteria on our Call for Papers page first. The main call for papers generally opens in August and closes in mid-October (early November for Honours graduates). Sometimes a second call for papers is run from around December to February. Subscribe to our newsletter to be notified when a call for papers opens. A sample breakdown of the selection and editorial processes for papers from submission to publication can be found on our Editorial Process page. It is also included in the PDF version of the Submission Guidelines included in the Submission Pack, which is available for download at the bottom of the Submission Guidelines page when a call for papers is open. Who holds copyright of the published articles? Information on copyright and licensing can be found on our Permissions page. I want to submit but I can’t make the deadline. Do you consider requests for extensions? We understand that other things can come up, and also that the deadline for our standard Call for Papers can be particularly tight for Honours students. If you would like to submit but need more time, contact us with your proposed submission date and we’ll see what we can do.